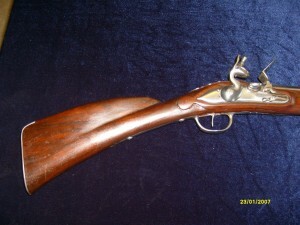 A Reproduction 1720’s musket by Derbyshire Arms. After the medieval era other methods of firing guns started to develop, although the matchlock continued to be used in parallel for at least another 150 years or so. By the late 1600’s, Flintlock muskets like the one shown above were the main weapon of the English soldier. They use a flint mounted on a sprung arm, which flies forward when the trigger is pulled, striking sparks from the hardened steel frizzen which fall into the pan over the touch-hole, firing the gun.